Liebert’s Datacenter thermal management products provide business continuity and outstanding energy efficiency with Chilled water and DX based solutions. Our vast product line includes In Room (CRAC), In Row and In Rack solutions. For outstanding PUE, outstanding chillers are required. Liebert’s chillers provide free cooling options with the HPC family. The AFC chiller family adds an adiabatic cooling option for even better PUE. 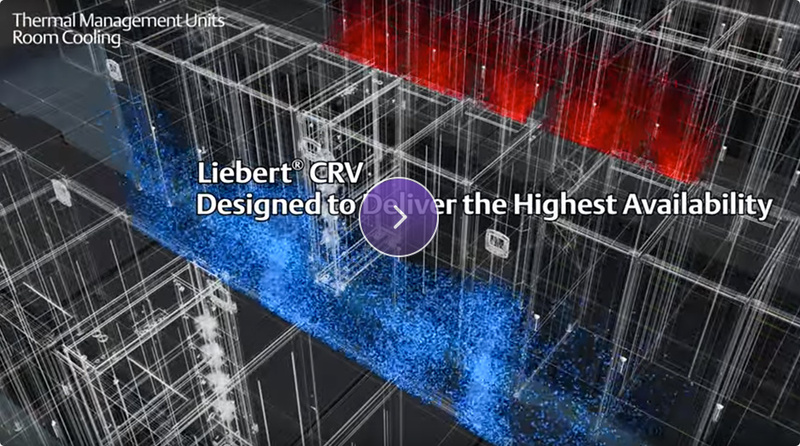 The holistic Vertiv (Emerson)-Liebert Data Center cooling system is managed by the ICOM software which manages all components from the active Smart-Aisle containment system, the internal CRAC and in-row units as well as the chillers. pPUE as low 1.15 can be achieved in the Israeli climate. Emerson Network Power’s Liebert brand makes possible the efficient, reliable and cost effective management of heat in your mission critical facility through unparalleled expertise and the industry’s most advanced service, software, and equipment technology. Emerson Liebert CRV Row Cooling units provide the best energy efficiency, the most capacity per footprint and the best reliability. In Rack Cooling is an efficient cooling method for very high density Data Center Racks. Liebert’s Data Centers chillers are designed for business continuity and high energy efficiency. The Liebert (Vertiv) Mini-Mate2™ is a flexible, space-saving system that is the ideal solution for small areas where space is at a premium.